Published Oct 29, 2017 Updated Jan 24, 2019 By Julia 49 CommentsThis post may contain affiliate links. 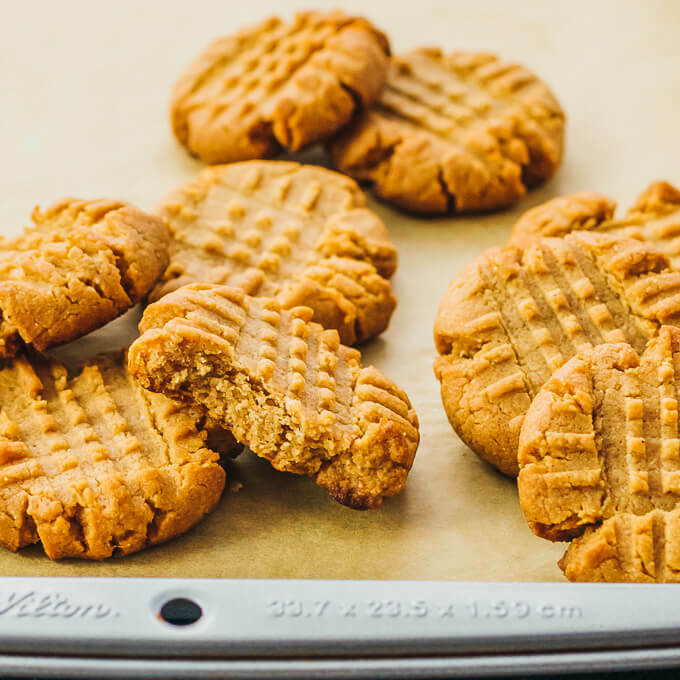 These keto peanut butter cookies are very easy to make, with only 4 ingredients. Either almond flour or coconut flour can be used; the recipe lists the amounts for each. Since these cookies are flourless and sugar free, they’re great for ketogenic, low carb, and gluten free diets. Here’s how simple and straightforward this recipe is: all you need to do is mix everything together, form into cookies, and bake. 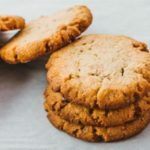 These cookies are crisp and crunchy on the outside, chewy and slightly soft on the inside — just like you would expect a peanut butter cookie to be. They are perfect as a healthy keto dessert or a snack on the go. This recipe was originally designed with almond flour, and I’ve recently adapted it for coconut flour. The respective measurements for each are listed in the recipe below. Both versions produce nearly identical cookies in terms of appearance, taste, and texture. 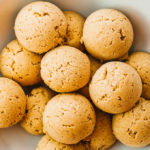 If you opt for coconut flour, the nutrition calculation is largely the same, with the net carbs per cookie identical and the calories reduced to 90 kcal per cookie. 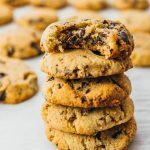 It’s possible to make these cookies with only three ingredients by avoiding any flour, but I prefer using almond or coconut flour because it helps bind everything together with a nicer texture. Any kind of grainy flour-like ingredient will work, even finely ground flax meal, whey protein, or any other low carb alternative. I use powdered erythritol, which is my preferred low carb sweetener because it has no effect on blood sugar or insulin. It’s a sugar alcohol that cannot be digested by the body, making it ideal for low carb desserts. It’s about 70% as sweet as sugar. The recipe calls for powdered erythritol rather than granulated; I typically buy erythritol in granulated form and powder it using a Nutribullet blender. You can do the same, or buy already-powdered erythritol. Note that the same weight of granulated erythritol will result in a noticeably larger volume of powdered erythritol. I’ve also provided the measurement for swerve confectioners, which is a powdered erythritol blend that measures the same as sugar. You can also use that value for any other powdered sweeteners that are also a 1:1 substitution for sugar. 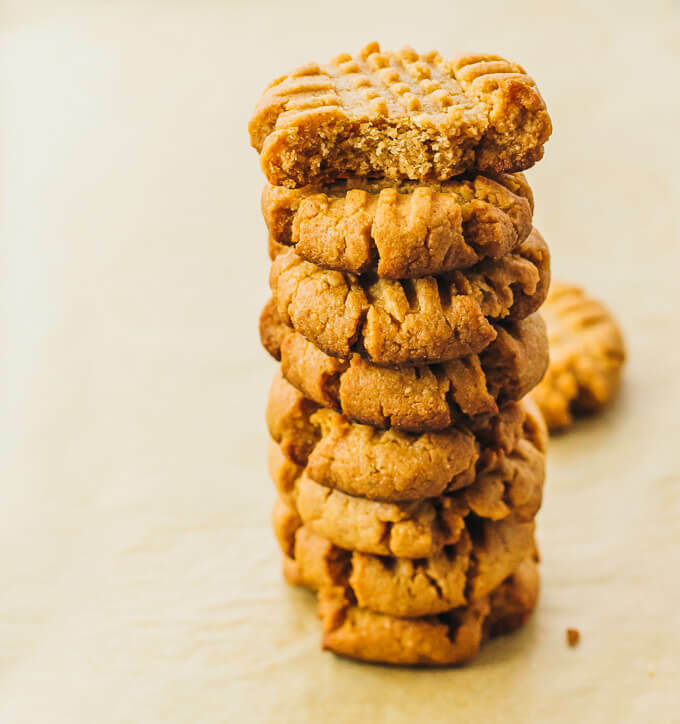 Since using swerve means you would use a smaller amount compared to pure erythritol, the ratio of dry to wet ingredients in the recipe is different and you’ll end up with slightly moister cookies. You can compensate for this by baking for a few minutes longer than indicated in the recipe. I use “natural” peanut butter, which typically means that it is made from only peanuts and salt, with no added sugars or other ingredients. Brands will differ on their wording, so your best bet is to read the ingredients label and only buy peanut butter made with just those 2 ingredients. Another thing to look at is the net carbs per serving. My nutrition calculation assumes peanut butter with 4g net carbs per 2 tbsp serving, which is a good benchmark to aim for when selecting a brand of peanut butter. I provide volume and weight measurements for each ingredient in cups and grams, respectively. For best results, use the weight values if you have a food scale. I prefer using weight because it produces more consistent results. Not to mention, fewer measuring cups to wash! These cookies won’t spread much as they bake. If you’re particular about their appearance, form your desired cookie shape, thickness, and size prior to baking. You can also have fun decorating the cookies however you wish — I use a fork to make a standard criss-cross pattern as I flattened each cookie. The recipe provides a range of baking times, not only because ovens vary but because you may prefer softer or harder cookies. For softer, chewier, and more moist cookies, you’ll want to bake for a time on the shorter end. For harder, crisper, and drier cookies, bake on the longer end. I typically bake for 15 minutes. These cookies are quite soft when they come out of the oven. Let them cool completely before serving, since they will harden as they cool. After the cookies have completely cooled, store any leftovers in an airtight container or resealable bag. They’re best when consumed within a few days. These keto peanut butter cookies are very easy to make, with only 4 ingredients. Either almond flour or coconut flour can be used; the recipe lists the amounts for each. 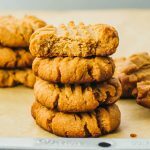 Since these cookies are flourless and sugar free, they're great for ketogenic, low carb, and gluten free diets. Prepare a baking sheet lined with parchment paper or a baking mat. In a mixing bowl, combine all ingredients and stir together until well-mixed. The resulting dough should be thick and dense. 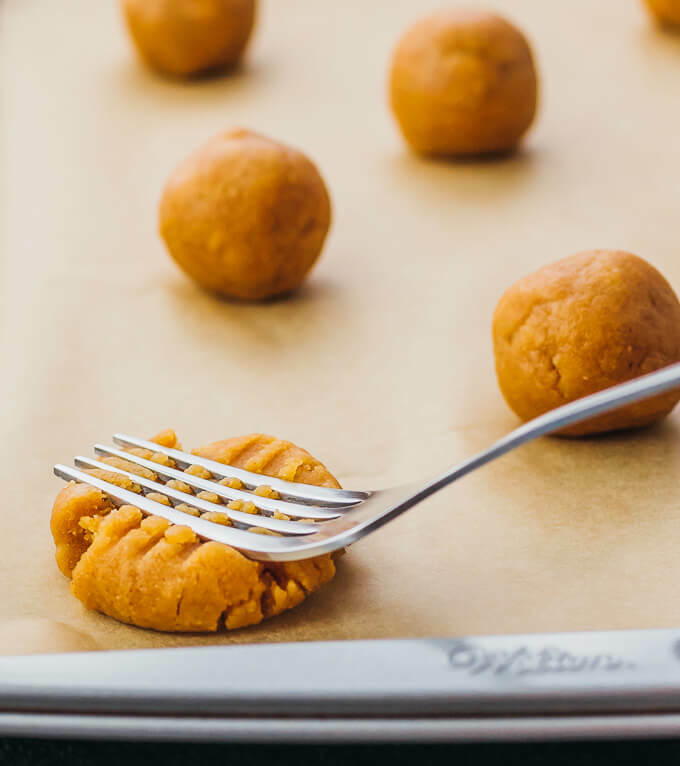 Scoop about 1-2 tablespoons of dough and form into a small 1-inch ball, placing the ball onto the baking sheet. Repeat until the dough is used up, resulting in about 18 balls. 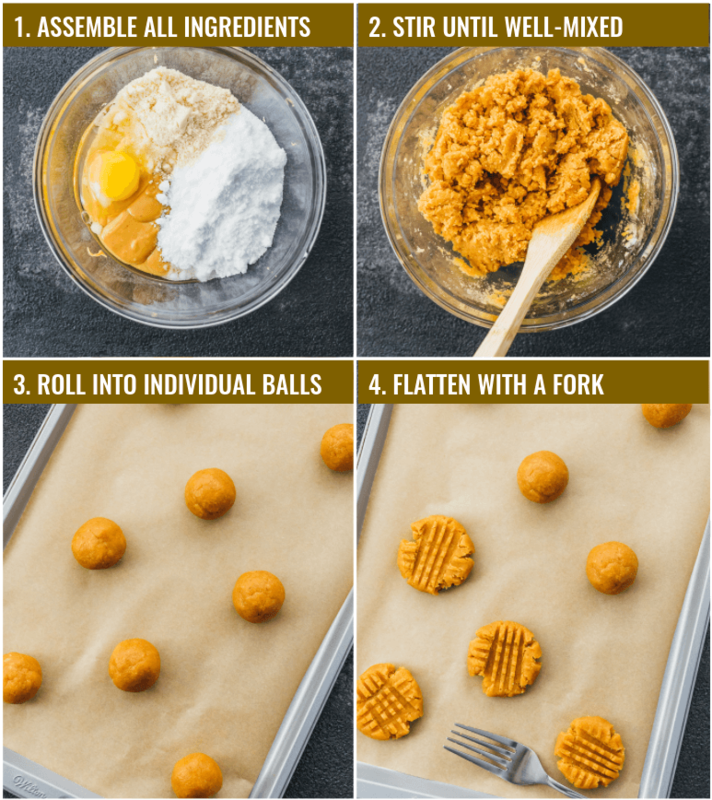 Arrange the balls on the baking sheet so that they are about 2 inches apart from each other. Flatten each ball by pressing down using a fork and rotating 90 degrees to press down again, forming a criss-cross pattern. Repeat for all balls until they are flattened. Bake at 350 F for 12-15 minutes or until the edges of the cookies are browning. Let the cookies cool before serving. They will be soft when they come out of the oven, and will harden as they cool. Yields 18 cookies. 12 minutes was way too long for my cookies- they were almost black before I realized they were actually burning. So after starting another batch- 7 minutes was perfect. Could be that your oven is running hotter than mine (I have an oven thermometer that I use to verify the temperature). I wonder if you would have a different baking time if you used an oven rack positioned in the lower half of your oven. I don’t have POWDERED erythritol… Can regular erythritol be used instead? When I was baking non-keto PB cookies before, I always used regular sugar over powdered sugar. Regular erythritol can have rather large granules, which don’t incorporate as well in dough, which can crystallize later and produce a “cooling effect” when eating them. To avoid these potential side effects, I recommend powdering regular erythritol using a small blender like a nutribullet. I loved this recipe. I even shared it with my family and many of them thought the cookies were even better than the real thing. 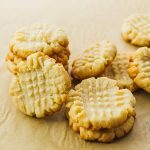 By far, this is the best peanut butter cookie recipe I have ever used. I made this recipe. It is very tasty. I am questioning the carb count. I used the carb counts from the ingredients and I came up with 6 net per cookie vs. the 2 in this recipe. Can’t you help me why my calculations are so different. Thanks! You’re not counting the erythritol, are you? Sugar alcohols are subtracted from total carbs, like fiber.